DAVISON TWP. 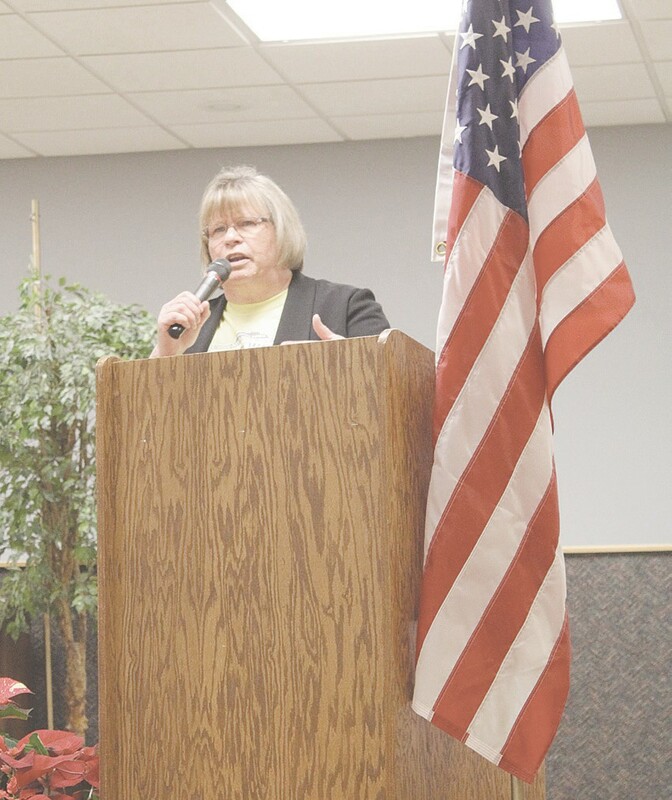 — The 41st Annual Senior Winter Games of Genesee County got off to a start, Feb. 4, with opening ceremonies and the pie eating contest at the Davison Area Senior Citizen Center. With 15 senior centers in Genesee County, hundreds are expected to participate. Jean Johnson, director of the Burton Senior Activity Center, was the key speaker at the opening ceremonies. She described the senior games as a great way for seniors to get out and get exercise during the winter, to meet new people and to encourage competition. Last year, for the 40th anniversary of the Senior Winter Games, Johnson said a video had been prepared, but was not shown at the opening ceremonies after they were cancelled due to inclement weather. So, the video was shown to this year’s attendees. Longtime participants in the games were interviewed as part of the video and many of them spoke about their experiences. The pie eating contest was the first event held in the Senior Winter Games. All of the interviewees said they took part in the Winter Games for their physical and mental health, as well as to make new friends and to enjoy their competitive side. The Senior Winter Games will culminate with a Closing Ceremony at the Davison Knights of Columbus Hall on Feb. 28. During the month, senior participants will have a variety of sports to compete in, including competitive table tennis, volleyball, archery, softball toss and bowling. There will also be a score of recreational games and activities to choose from, such as Euchre, Karaoke, line dancing, pie eating and baking. Most of the events will be spread out among 12 area senior centers, as well as special venues like Kettering University, Richfield Bowl and Sharky’s Sports Bar (for pool tournaments). Following the ceremonies, the games held their pie eating contests for both men and women. Also, in attendance were area dignitaries, including Genesee County Commissioners Bryant Nolan, Ted Henry, Ellen Ellenburg, David Martin, Kim Courts, and Flint Township Trustee Barb Vert.